Menura novaehollandiae Latham, 1802, Upper Nepean River, New South Wales. 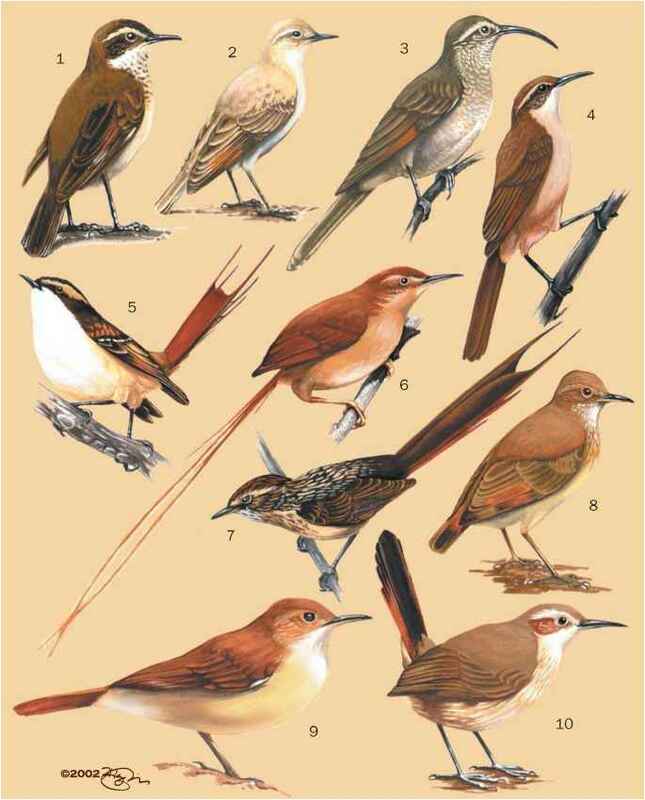 Three subspecies. English: Superb lyrebird, Edward lyrebird, Prince Edward lyrebird, Victoria lyrebird, Queen Victoria lyrebird; French; Menure superbe; German: Graurucken-Leierschwanz; Spanish; Ave Lira Soberbia. The lyrebird was well-known to the Aboriginal people. Names from various language groups included: balangara, bulan-bulan, beleck-beleck, golgol, and woorayl. The double names almost certainly were derived from the loud double notes of the lyrebird's "pilick" song. 30-39 in (76-100 cm); female 1.9 lb (0.88 kg), male 2.3 lb (1.06 kg). Male has highly ornamental tail, 28 in (71 cm). Outer pair of feathers elongated S-shape, decorated with semitransparent "windows"; six pairs of filamentary feathers; central pair very narrow. Very strong legs and feet. Long claws span 6 in (15 cm). 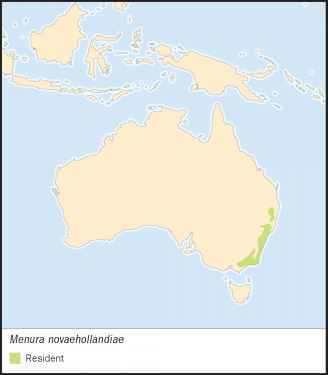 M. n. edwardi: Hunter River north to near Stanthorpe; M. n. novaehollandiae: Hunter River to Victorian border; M. n. victo-riae: Victoria, east of Melbourne, plus Snowy Mountains to Brindabella Range in New South Wales. Wet sclerophyll forest, subtropical and temperate rainforest, Antarctic beech (Nothofagus) forest, dry sclerophyll forest, eucalyptus woodland. Separate male and female territories. Males sing and display on arenas consisting of low earth mounds. Sedentary. Mostly solitary, occasionally two or more together. Forage on the ground for invertebrates in soil and litter, scratching and digging to a depth of several inches (10 cm). Males promiscuous. Female alone builds nest, incubates the single egg, and cares for the chick, which sometimes still begs from its mother at start of next breeding season. All three subspecies are not threatened, though considerable reduction in habitat through European settlement. Some small isolated populations may be at risk.